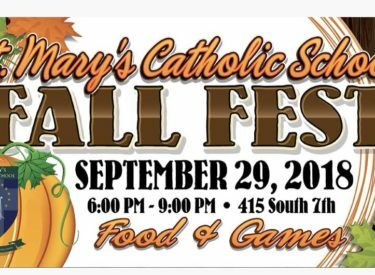 St. Mary’s Catholic School’s Fall Fest, the school’s largest and most exciting fundraiser, is 6 to 9 p.m. Saturday, Sept. 29, at 415 South Seventh Street. It’s open to the public and includes great food, such as bratwurst, hamburgers, hot dog, funnel cakes, caramel apples and more. The crowd can enjoy games such as a cake walk, inflatables, a gaming trailer, toddler area, petting zoo, and dunk tank. There’s a silent auction that closes at 9 p.m. and a live auction starts at 7:30 p.m. which will include a cabin rental, boat rental, custom oak cabinet and more! Join us for a great time and lots of meaningful fellowship. Volunteers always appreciated!